The Wildwoods, NJ – April 18, 2018 – This Mother’s Day weekend Morey’s Piers invites the entire family for a seaside escape to honor mom. 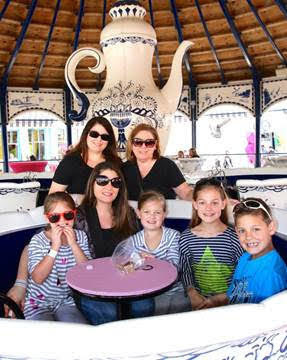 From hotel packages and a tea-riffic tea party at the beloved Tea Cups ride, families will find a variety of events and activities to make every mom feel special. On Sunday, May 13, mothers visiting the classic shore side destination will ride free from 12 pm to 5 pm on Mariner’s and Surfside Piers. From 12 pm to 2 pm, families are invited to Mariner’s Pier to grab a seat in an oversized “English tea cup” and sip complimentary afternoon tea with an assortment of cookies, biscotti, and biscuits. Kids can also decorate personalized sugar cookies for mom at the cookie decorating station located next to the Tea Cup ride. Tea and cookies are available while supplies last. Live music, a balloon artist, and pop-up dance performances by Shorestop Dance Convention ambassadors are scheduled to take place throughout the day. The Parents Pavilion on Mariner’s Pier will be transformed into a photo area complete with signs and props for mom and the whole family to take pictures. From 11 am to 3 pm, Jumbo’s Grub & Pub on Mariner’s Pier will serve up a special Mother’s Day brunch featuring pancakes, omelets, a breakfast burger and more. The restaurant will also be shaking up cocktails to toast mom including a classic Mimosa, Bloody Mary, Bloody Maria, and even a MANmosa for dads. For dinner families can treat mom to a meal at Jersey Girl starting at 5 pm. The restaurant, located a block away from Mariner’s Pier, is under new management this season and will be rolling out a refreshed menu while offering the same Jersey Girl vibes. Available May 11 through 13, The Pan American Hotel and Port Royal Hotel are offering family stay weekend packages that include a two-night stay for two adults and up to two children (in one room), one day admission to amusement rides at Morey’s Piers and one complimentary breakfast per person at the onsite restaurant. Prices start at $395 per family at both hotels. Rooms subject to availability; price does not include hotel tax. To book at the Port Royal, guests must call 609-729-2000 and for the Pan American guests must call 609-522-6936 and request the Mother’s Day Weekend package.